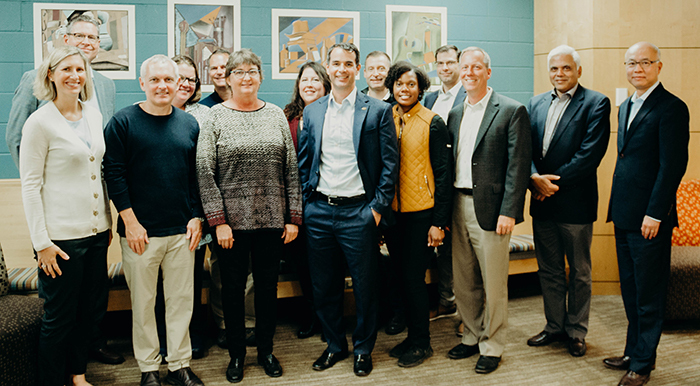 The Mounds Park Academy Board of Trustees is a self-generative body of approximately 20 trustees (plus the Head of School in an ex officio capacity), who guide the school’s strategic direction and protect its mission. Critical functions of the Board include hiring, supporting, and evaluating the Head of School, establishing the school’s mission and strategic plan, supporting the school’s development efforts, and safeguarding the school’s financial stability. The Board of Trustees awards MPA’s graduating seniors their diplomas. The Board’s purview is strategic, not operational (which is the responsibility of the Head of School and his or her Administrative team). Specifically, the Board does not hire or terminate employees or establish policies for doing so. It does not make line-item budget determinations, including those on faculty salary; it does not establish academic scope and sequence of classes. Rather, the Board collaborates with the Head of School to ensure that the school’s larger strategic goals are met, including accreditation, legal compliance, and other requirements. Executive Committee: Is comprised of the Board chair(s), other officers, and additional thought-partners to the Board chairs; establishes the Board’s meeting agenda; sets key Board goals for the year; works with the Head of School to determine Head of School goals and evaluates his/her performance; and serves as an initial board crisis committee when required. Governance Committee: Identifies new trustees, evaluates trustee performance, considers Board committee structure, directs the Board’s professional development, reviews the school’s articles and bylaws, establishes Board policies, and supports committee succession planning. Finance Committee: Offers strategic advice and direction to the Business Office in setting its budget; oversees the investment choices of the school’s endowment; works with the Business Office to establish annual tuition recommendations for the full Board’s consideration, reviews audit results, and establishes financial strategies to ensure the school’s financial stability. Development Committee: Supports the school’s Director of Development in evaluating strategic direction, determining annual fund and other leadership opportunities, and evaluating any capital campaign plans. Enterprise Risk Management Committee: Identifies, prioritizes, and evaluates risks to the school’s mission, reputation, or existence, and calibrates the Board’s appetite for risk with the school’s plans and allocation of resources. The Board’s Governance Committee is responsible for identifying new trustee candidates. The Governance Committee solicits and maintains an on-going list of qualified and interested trustee candidates for consideration. In addition to strong leadership skills and a Board that collectively reflects broad diversity of experience and backgrounds, areas of desired professional experience include: finance, accounting, investment, banking, business, education, law, governance, strategic planning, development, marketing, community service, and leadership. If you know of someone (including yourself) who would be interested in serving on the Board of Trustees, please contact Beth Finch, Chair of the Board’s Governance Committee, at beth@finch-co.us for the nomination form.